EV3000 camera is a Day-time, Night, Dark, Fog, Rain, and Smoke 24/7 surveillance camera system. EV3000-D-IR has dual sensor a thermal camera and HD day camera, rugged PTZ housing for all weather, resist high humidity. The available ranges are 1km 2km 3km 4km 5km 6km 7km 8km 9km 10km 11km 12km 13km 14km 15km 16km 17km 18km 19km 20km with or without Night Vision IR FLIR Thermal Camera. 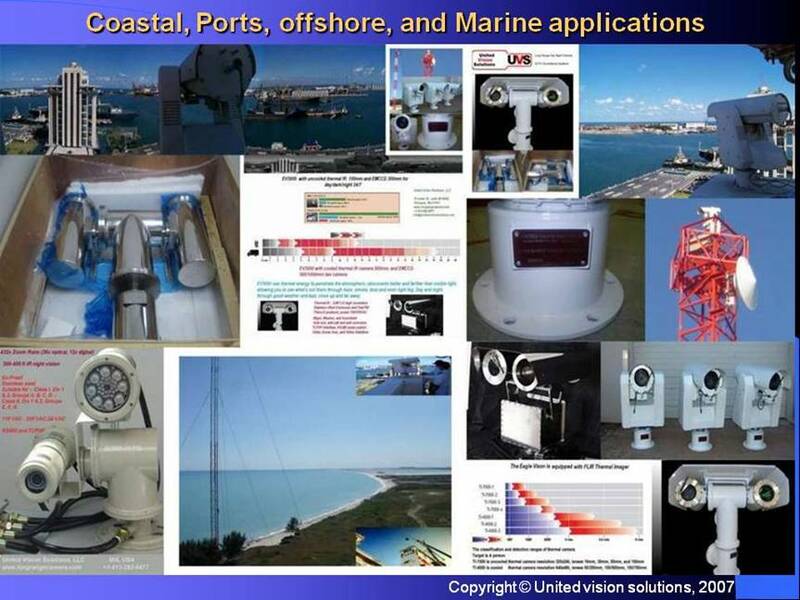 United Vision Security Systems was the first company worldwide to integrate a 1000mm lens with emccd cameras in a stainless steel platform using fiber-optics for video and controls in a Mexican Navy port project. With its built-in night vision, Electron Multiplying ccd the Eagle Vision has a light sensitivity that 100 times better than average competitor cameras. The fact that this camera has been selected as the solution for the unmanned surveillance needs of military front lines proves its capability.